Registrar offers deep discounts on .ME domains with the purchase of a Hosting package. 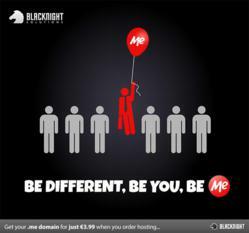 Leading Irish registrar and hosting company Blacknight want to help customers get noticed online with .ME domains. From now through November 22nd 2012 Blacknight is offering the Minimus.me promotion through which customers can register a .Me domain name for only €3.99 (ex-VAT) with the purchase of a yearly Minimus Hosting plan. .ME, the Internet extension for people, is the fastest growing domain in Europe and is ideal for individuals, families and start-ups. .ME is the perfect way to create a completely personalised identity online. Great for blogs, personal websites, life streaming and sharing photos; imagination is the only limit to the uses for a .ME domain. The .ME discount applies to first year domain registrations only and must be purchased with an annual Minimus Hosting plan. The Minimus package includes 10GB of server storage space as well as 200GB a monthly transfer, which is perfect for most small blogs and small business websites. Minimus Hosting also includes, e-mail, FTP, MySQL, MSSQL, spam fighting tools and the ability to host up to 30 websites. At less than €50 a year Minimus users also have the ability to choose between Linux or Windows, easy Wordpress installation, use of the Plesk site builder to create simple websites and of course, Blacknight's legendary chivalrous support services. To take advantage of the Minimus.me offer, just add the Minimus package and .ME domain of choice to the Blacknight shopping cart and the discount will automatically appear at checkout.